1.0 (based on 2 ratings) Thanks for your rating! Product #45495 | SKU SWIT-S-8152S | 1.0 (based on 2 ratings) Thanks for your rating! 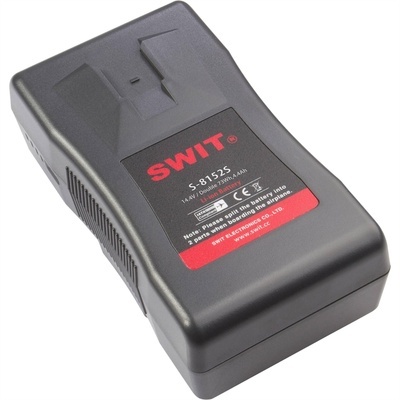 The S-8152S 73 + 73 Wh Split-Style V-Mount Battery Pack from SWIT ships disassembled in two parts of 73 Wh each, which can also be assembled together for a total capacity of 146 Wh. The battery pack comes with a D-Tap DC output socket that supplies 100 W, 8 A power (maximum) to add-on accessories, such as on-camera lights, monitors, wireless transmitters, etc. It also features a four-level LED indicator that gives you a quick view of the remaining power. Its built-in intelligent circuit provides voltage, current, and temperature protection. This battery pack complies with the IATA air transportation regulations and is not restricted for air travelling.